While I want LIFXtend to work for anyone, for LIFXcl a little knowledge of the LIFX Network is useful. When you first install your bulbs, you connect them to your wifi. That's behind us. Everything I talk about now is after the initial setup is completed. As long as the bulbs have power, even if they are shut down, they are connected to each other. This connection (represented in yellow) is called a PAN, or Personal Area Network. They communicate their network status / signal strength to each other, and then decide which bulb[s] acts as a "Gateway". In small setups close to each other, that will be only one bulb. Though sometimes, more than one bulb acts as a gateway, probably because the individual bulbs cant make a connection to each other via the PAN, so they need another way to communicate. The gateway bulbs (depicted bigger in the picture) are the only bulbs that are connected directly to your wifi, and as such they are the only bulbs that actually receive an IP. All bulbs in your network have a MAC Address however, which is a unique identifier. Each bulb (probably worldwide) should have a unique Mac Address, for example d0-73-d5-01-28-78. The first part d0-73-d5 is the same with all LIFX bulbs. 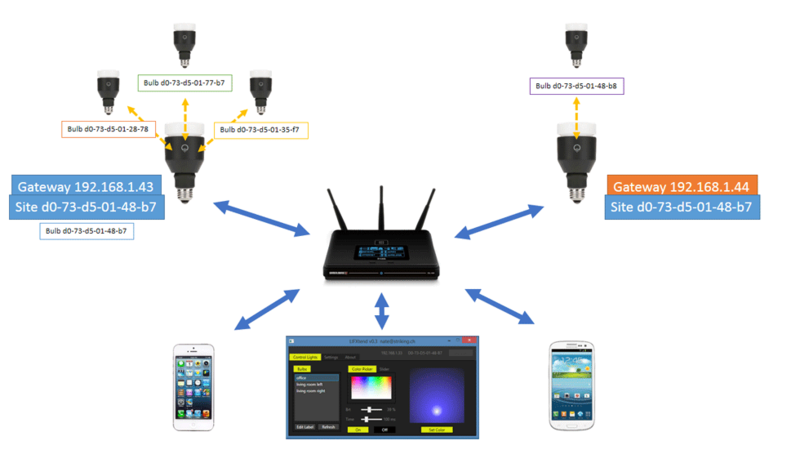 All bulbs on your network will be on the same "Site". The "Site" is important, it is the Mac Address of the "Master" bulb. So even if you have two or more gateway bulbs, they still belong to the same site, and only one of them is the master.